The root of Paeonia lactiflora Pall, or P. veitchii Lynch of family Ranunculaceae. Inner Mongolia, Hebei provinces and northeast of China. Chuan Chi Shao is mainly produced in Sichuan, Shaanxi,and Qinghai provinces. Fragrant smell, slightly bitter, sour, astringent taste. 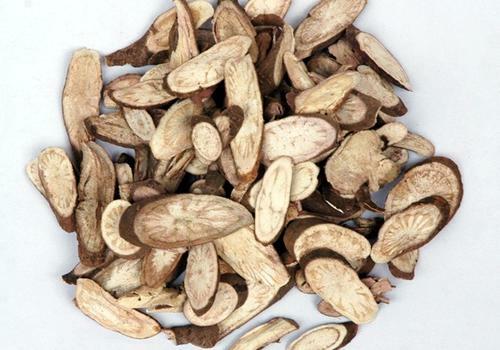 Large and long root, big and dark wrinkle, white cross-section, and easily exfoliated bark, easily made into powder. Bitter, pungent, light cold; liver meridian entered. Clear heat and cool blood, activate blood and resolve stasis, clear liver fire. Its actions of heat-clearing and blood-cooling as well as stasis-resolving are similar to that of Mu Dan Pi; both of them have the characteristics of cooling blood without leading to blood stagnation and activating blood without leading to bleeding; it is also a commonly used herb for clearing heat and cooling blood, but is not as good at clearing blood heat as Mu Dan Pi does. So they are often combined together for mutual reinforcement in aspect of cooling blood and resolving stasis when treating heat entering nutrient-blood manifested as macular, papule, hematemesis and apostaxis; meanwhile heat-clearing and toxicity-removing herbs and hemostatics should be combined for reason of taking effects of cooling blood, stopping bleeding, resolving stasis and curing macular, for example, Da Huang, Shui Niu Jiao, and Raw Di Huang, etc. It has better action of activating blood and resolving stasis, and excels in stopping pain caused by blood stasis. It is much suitable for treating syndrome of stagnation due to blood heat, which is similar to that of Mu Dan Pi; while it is also indicated for treating stagnation due to congealing cold when being combined with meridian-warming and cold-dispelling herbs or blood-activating herbs which are warm and unblocking in nature. So it can be used to treat both syndrome of blood stasis manifested as irregular menstruation, dysmenorrhoea, amenorrhoea, abdominal mass, traumatic injury with swelling pain, ulcer, abscess, dysentery and abdominal pain, and other syndromes accompanied with stasis. For hypochrondriac pain due to liver depression with blood stagnation, it is combined with Chai Hu and Mu Dan Pi, etc. For dysmenorrhoea, amenorrhoea and abdominal mass caused by blood stagnation, it is used with stasis-resolving and menstruation-regulating herbs. For instance, it is used with Dang Gui, Chuan Xiong and Yan Hu Suo and so on in Shao Fu Zhu Yu Tang recorded in Yi Lin Gai Cuo. (Correction on the Errors of Medical Works). For traumatic injury, swelling pain with blood stasis, it is combined with blood-activating and pain-stopping herbs, such as Tao Ren, Hong Hua, Dang Gui. For abscess and sores caused by heat-toxicity accumulation, it is often combined with heat-clearing and abscess-curing herbs. For example, Jin Yin Hua, Tian Hua Fen, Dang Gui, and so on in Xian Fang Huo Ming Yin from Jiao Zhu Fu Ren Liang Fang. For dysentery with abdominal pain, it is combined with herbs of clearing heat and drying dampness and herbs of removing toxicity and checking diarrhea for mutual reinforcement, such as Huang Bai, as in Chi Shao Yao San from Sheng Hui Fang. It excels in clearing liver fire, and is indicated for blood-shot eyes with swelling and pain, photophobia with profuse eye secretion. It is often combined with liver-fire-clearing and vision improving herbs, such as Ju Hua, Xia Ku Cao and Jue Ming Zi, etc. It is antagonistic to Li Lu.